Are Berkeley Blacks Getting The Respect They Deserve? Splitting 5-4 along conservative lines, June 25 the Supreme Court ruled unconstitutional a key provision of the Voting Rights Act. 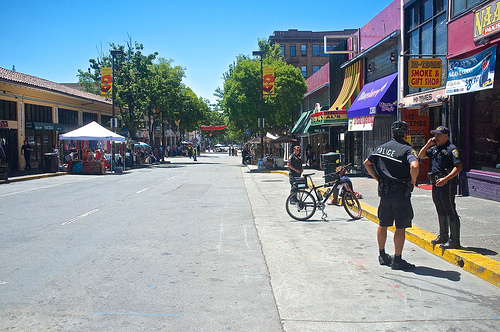 Two days earlier Berkeley held it’s twenty-sixth annual Juneteenth fest. Local media did not cover the festival, unless you count pre-event stories. Is it enough to announce an event without reporting on it? I hope to remedy this. Berkeley Reporter was there photographing, hoping that the publication which pays me as a “contributing photographer,” would publish my shots with their coverage. They had no story and I was told they didn’t want a photo-essay either. The photo essay appears here. 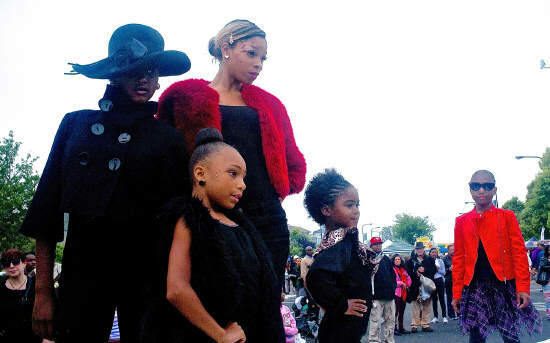 Proud black women, an event theme. The kids here are truly sisters – a one family production. Photo by Ted Friedman. Customer flight can be a terrible thing. Like girlfriend flight or money flight, which rimes with blight, which is what Teley merchants are fighting. A lot has gone wrong for this hardy band of avenue loyalists. Teley/Haste was once the very soul of Berkeley, possibly its real center, like Sixth and Monroe in my boyhood hometown. Both locations — Teley and Sixth/Monroe — are blights. Customer flight on Telegraph. This block is usually filled with shoppers and street vendor. Photo by Ted Friedman. Berkeley has not shed its radical past, which often put it under government surveillance, nor have I. (My story will be told last). Seth Rosenberg, award winning SF Bay Area investigative journalist, traces FBI surveillance at U.C. Berkeley to the early WW2 years in his recent expose of gov’t surveillance. Berkeley radicals have had a half century to adjust to big brother tactics. Except for wide-spread Berkeley activities on behalf of whistleblowers, like Snowden and Manning recently, there has been little personal concern from Berkeley rads who assume they’re being watched. You might wonder if this isn’t Berkeley bragging. 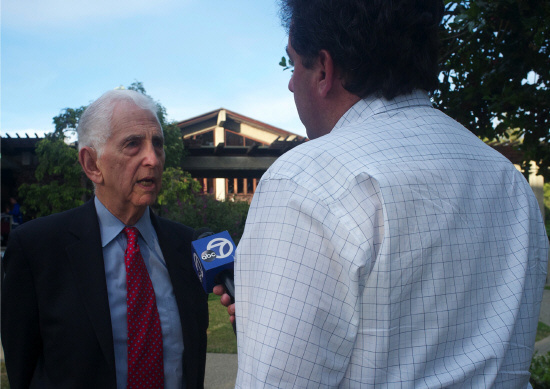 In a press interview, Tuesday in Berkeley, Daniel Ellsberg, who leaked the Pentagon Papers during the Vietnam War, took questions about leaking. I was there taking pictures. Saying “I don’t know him [Edward Snowden, who recently leaked government surveillance of Americans]; I would have advised him not to do it, but I’d be wrong. If Snowden has to spend the rest of his life in jail it would be worth it to tell the public what our government is doing,” Ellsberg said. He has written that fifty-two years ago he was inspired to leak by a jailed draft resister, who said he was glad to be joining his friends. 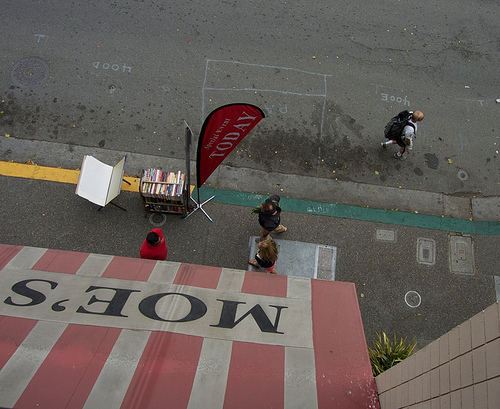 Weeks of Troubles and MTV on Berkeley’s Telegraph Avenue Ends in Disaster. WHAT IF THE WHOLE WORLD THAT WAS WATCHING — stopped? First there were a slew of troubles on Teley. There was an O.D. in nearby People’s Park and Purple was slashed outside the Med. Although the city of Berkeley seems to be doing everything it can to rescue the avenue from decline, its latest effort on behalf of Teley merchants is being called a disaster. It was no more than a week ago that MTV shot at Moe’s in a throwback to the filming of “The Graduate” at the Med in 1967. Hopes for Teley are high because several projects to revive a blighted area at Telegraph/Haste are on the move. Not so special event. Photo by Ted Friedman.